Winter cold, ice, snow reign in the Ozarks for another month or so. Coats, hats, long underwear add girth and still the cold seeps through. 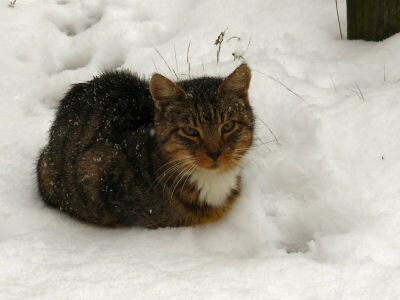 The cats sit and play in the snow in their wonderful fur coats. Tyke and Cloudy have shared the barn for several years. Tyke was there first and is older. They stay in the barn by choice pretending to hunt mice. They do catch a few to impress me from time to time. Over the winter the two cats found cozy beds in the hay or on extra goat blankets and coats. The house was used overnight only in extreme cold and for cat food. My cat Cloudy is one tough cat. His winter coat is an inch thick. He races and jumps through the snow. He makes small snowballs to bat around. He can’t understand why I don’t want to stay out with him. Running fingers through the cats’ wonderful fur coats is to find them thick and soft. A generous undercoat makes the coats like deep plush velvet. This traps heat. The outer fur sheds water to keep the undercoat dry. Tyke is getting older and now sleeps on the floor in the house. He prefers the cold floor to warm blankets. I don’t mind as he doesn’t share well and thinks my side of the bed is his and I can move elsewhere. This bed stealing is a subtle thing. He waits until I am asleep, moves up against me and shoves. I roll over. He repeats. Lucky for me he starts on the outside or I would be on the floor. Days Tyke goes out. He catches mice in the hen house. He catches voles in the pastures. Rain or snow, he goes out. My cat Tyke comes into the house with snow or rain on his fur and uses my leg for a towel. I see him out in the pasture walking through the grass in any weather. He seems unaware that such weather should chase him indoors. Cloudy is more of a clumsy clown when I see him. He loves showing off bounding through show, racing up trees, leading the way with sudden stops to trip me up. Days in the twenties don’t slow him down. As I put on the layers getting ready to go out to milk or put out hay or carry water, I look at those wonderful fur coats and sigh. I try to remember that next summer those fur coats won’t look so tempting. 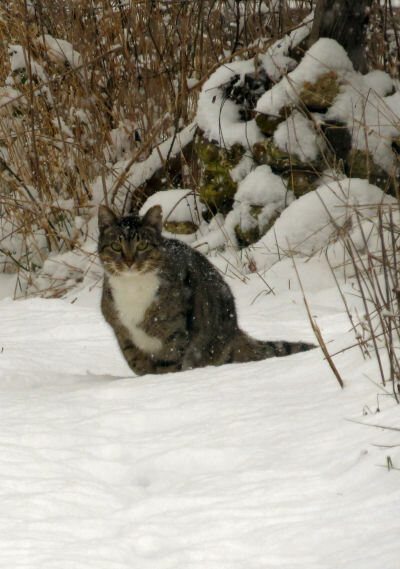 This entry was posted in High Reaches and tagged cats in the snow, winter in the Ozarks on January 30, 2019 by [email protected].